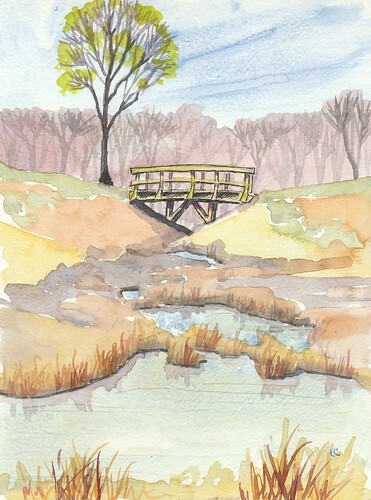 The Bridge – Watercolor – Let's Paint Nature! 62°F and very breezy. Somehow you don’t mind the wind when it’s mild, even if strong. I could sit here for hours. After only a few minutes, to my surprise, a flock of ducks descend on the water. But these are no common mallards. What are they? They communicate with each other by “whisping”….whisp, whisp, whisp. It’s a cross between a whisper and a hiss. One performs some kind of walk-on-water dance. Was he impressing a female? I believe these are blue-winged teals. I watch them with great wonderment. They don’t feel my eyes prying, staring like a rude intruder. He wants to be in your daily life. He isn’t a God who sits on a fluffy white cloud waiting to strike you down. He is love and wants to communicate with you through prayer. He also promised to never leave you nor forsake you. That’s good news especially in our tumultuous times. A stranger walks towards the water and the bridge. 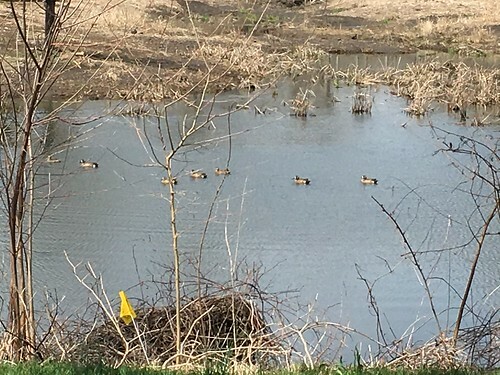 Not only do frogs on the fringe of the pond shriek and leap for their lives into the water, but my ducks become frightened too and swim out of sight. Chorus frogs steadily call in the background. The seen and unseen mysteries of life are fascinating. It’s all attainable, doors will open if you knock. Great metaphor. Isn’t it wonderful how creating art can bring us to this place? Thank you. I am a beginner but I am excited. Never let go of that excitement! It’s the spark that will keep you going.